Volunteers are needed at the PFF Walk Chicago on Saturday, September 14th at Diversey Harbor. Volunteer positions include event set-up, registration, t-shirt distribution, 5K course marshalls, food distribution, & event tear-down. 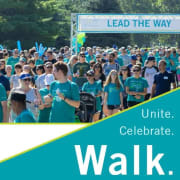 The PFF Walk offers an inclusive opportunity for those who have been touched by pulmonary fibrosis to unite in the search for a cure, share their stories, celebrate their loved ones, and walk together with our community of patients, caregivers, healthcare professionals, and friends. Funds raised through the PFF Walk program support vital research and sustain patient initiatives that help those living with the disease and their families live better lives.